"Completing the challenge is extremely fun. It offers a platform for my friends and I to motivate and support each other towards reaching our goal"
If you ever find yourself twiddling your thumbs and seeking some much-needed motivation, then look no further than Pam Lonsdale and her Liverpudlian peers. From trekking rugged Australian terrain to soaring the thrills of indoor skydiving, the retired friendship group certainly don’t fear the word ‘challenge’. Pam, who is 68 years old and lives in Liverpool, recently went through a spinal fusion which impacted her everyday lifestyle and physical activity routine. The close-knitted group have embraced adrenaline fuelled experiences such as assault courses, zip wiring, dragon boat racing, horse riding, Segway’s, and climbing Mount Snowdon. Taking part in such ranging activities wouldn’t be possible without having friends who share the same ‘can-do’ attitude as Pam. Looking for a new challenge for 2019, Pam was made aware of Tri January, a British Triathlon led campaign which encourages individuals and groups to swim or row, bike and run throughout January. After seeing the campaign featured on BBC Breakfast, Pam and her friends immediately signed up. 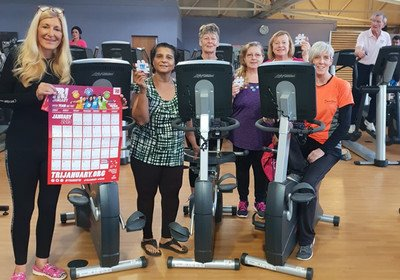 After recently setting out to the Peak District for some trekking, Pam and her friends covered significant ground which means they have nearly reached their 15km goal. As a result, the determined group are planning to sign up to ‘Team Bushell’ whereby they will aim to conquer the 25km distance. “Tri January has provided my friends and I with some much-needed enthusiasm and motivation to get through January. We love all types of sport and physical activity, but Tri January primarily appealed to us because we could still have fun together whilst fitting the challenge into our daily routines. I call it social harmony! If you’re inspired by Pam’s story and want to share your story. Drop us an email at info@gotri.org and we'll be in touch.